Age's Crochet Pages: Been getting out. These days it's been all about Etsy items and getting out of the house. I am planning a Zombie Brains How-to, but I need to decide how I'm going to handle it. In the meantime, I've been out hiking quite a bit more than usual this year and I couldn't be happier. 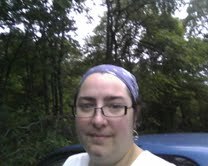 I know the pic doesn't show it, but that was taken at dawn and I'm not a natural early riser. 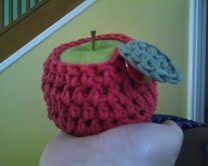 I've been working on some quirky little pieces for the Etsy shop, like Apple Cozies. They seem incredibly silly, but they do actually help prevent your apple from bruising while it's in your bag. And I've been putting together some terrariums with various Tillandsia Ionantha plants in them. They're a great "small space" gardening option for window sills and desk areas and well as being incredibly easy to care for. Plus, who doesn't love a plant that requires NO DIRT! Love your apple cozie and little bitty terrarium! I have to admit though that at first glance I thought the apple in the apple cozy was a tealight candle. And I was wondering why you weren't worried about the yarn possibly catching fire. LOL. What can I say, sometimes I have an active imagination. I never realized it was unclear in the photo, but Liam thought it was a candle too. Oops. Thank goodness for photo captions! Another Custom Request: Roast Turkey!